The internet isn't just a bunch of cables, wires, modems, computers, silicon, protocols, h-tee-tee-pees and h-tee-em-els. There are people behind it! People with personality. People who like to laugh. People who put up hilarious 404 error pages so whenever something goes wrong on the Internet, people will remember that they exist! The regular 404 error pages are a snooze fest galore. Adding personality is always a good thing! 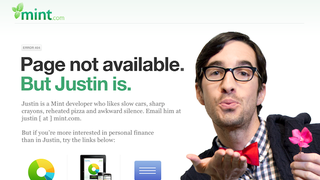 Here are some of our favorite 404 error pages on the web, starting with Mint's. You can find more hilarious 404 Error web pages at Hacker News, Quora, and Fab 404.